Near the river steps...there is a shrine, and folks are selling merit-making things. 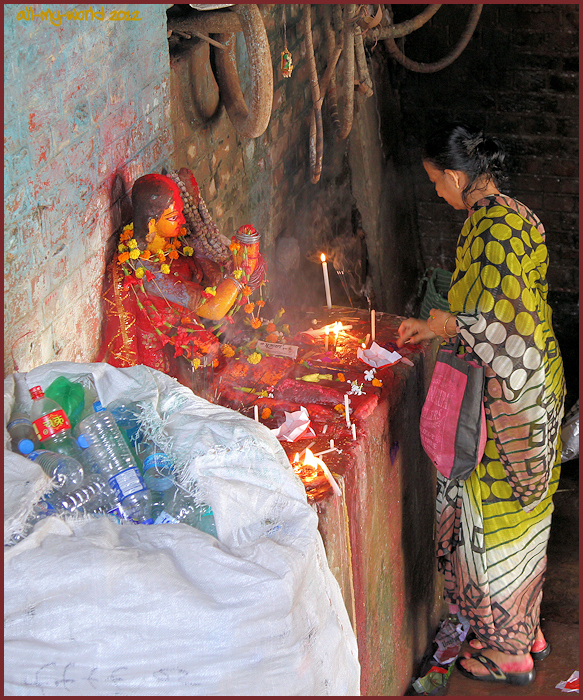 The large polycloth bag is full of empty water bottles...these are available for you to take down to the river to fill with Ganges Holy Water. These three shots capture the spirit of this colorful market. The only thing missing is the scents! Ray: Thank you, Beth. The scents are there, and they are powerful players in the drama. Quel bel étalage coloré ! J'aime ces scènes de rue. Ray: J'ai adoré cette balade le long du sentier le plus intéressant, Martine. I loved this stroll along the most interesting footpath, Martine. What a nice colourful scene. Ray: I am sure the locals will be happy if you leave it all for them, Chris. I thought that was stuff to eat Ray, and anyway, where is the burger van? Ray: Indians are not much into burger, Chad...more inclined to dahl. Ray: Unfortunately, Bill, the Holy river is also an open sewer. Ray: All the senses are given a healthy workout, Larry. I just love all the great colors! Ray: India is many wonderful things, Elizabeth, and "colourful" is one of them. I can't imagine the Ganges holy water is very healthy! you got some fine shots of the dealings going on, Ray. 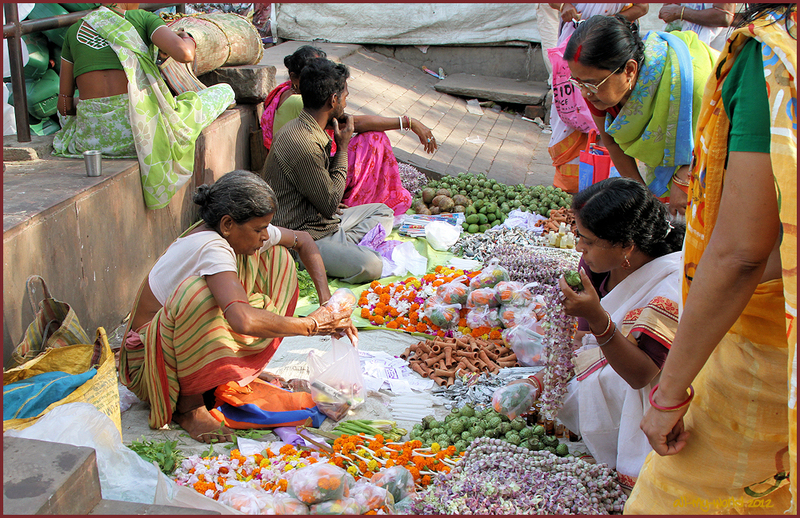 if i understand from your description correctly, you are perhaps in the Mallick Ghat flower market, which is a rather large fresh flower market.